When I found out I was pregnant with my son, I expected that I’d have the usual pregnancy side effects – i.e. morning sickness (I actually ended up with hyperemesis gravidarum,) weight gain, fatigue, achy joints, etc. But one side effect that I didn’t expect was terrible skin. Full disclosure – I’ve never had that soft, porcelain skin that some people are blessed with. But before I got pregnant with my son, my skin was fairly even and soft. And during my pregnancy, I didn’t notice much difference. But afterwards…. my gosh. My skin, particularly my forehead, looked like a cross between a pimple-prone 15-year-old boy and someone who had stood too close to a wood-chipper. I’m talking red, splotchy, bumpy, “can’t decide if it wants to be oily or dry” and virtually impossible to disguise with makeup. Thus started my quest to fix my terrible forehead skin. One of the first steps I took was to ensure I was properly hydrated. Our skin is an organ, and just like any other organ in the body, it requires water to function properly. Dehydration causes the skin to become dry, flaky and tight, so I made it my mission to increase my water consumption. It was during this “water bender” as I like to call it, that I discovered fruit-infused detox water. I’m one of those weird people who actually enjoys the taste of plain water, but I liked the idea of adding various ingredients that might help with improving the appearance of my skin. 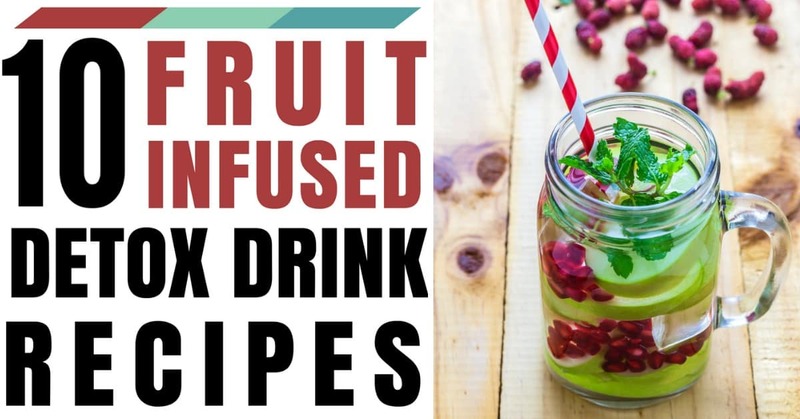 If you don’t like the taste of water or find it boring, then you’ll love these fruit infused water recipes. The best and most convenient way to naturally flavor water is by using a fresh fruit infused water bottle. Note – for maximum flavor and nutritional benefits, it’s recommended that you allow 1 hour for the ingredients to infuse. However, it’s fine if you don’t have the time to wait! Cut the aloe vera leaves in half lengthwise and scoop the aloe gel out. Add aloe gel to water and blend. Pour into glass bottle and add fresh mint leaves to taste. Add all ingredients into infusion water bottle. Peel ginger and thinly slice. Add ginger and lemon to infusion water bottle. Half strawberries. Add strawberries and lemon wedges to infusion water bottle. Slice cucumber. Add cucumber, mint leaves and pinch of salt to infusion water bottle. Add all ingredients to infusion water bottle. Add all ingredients to infusion bottle. Remove skin from kiwi, slice flesh. Leave skin on orange, slice. Add to infusion bottle. Slice strawberries. Add sliced strawberries and mint leaves to infusion water bottle. Slice pomegranate, remove pearls. Leave skin on apple, slice. Add pomegranate pearls and apple to infuser.